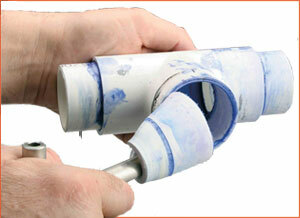 With Pipe Debonder, a considerable amount of time and money is saved in the PVC pipe repair process. By not replacing fittings, most broken pipes can be repaired and back in service 50% faster and 80% cheaper than by using yesterday's repair methods. Pipe Debonder simplifies the process of repairing PVC piping, fittings and manifolds, saving time, effort and costs. Utilizing tightly controlled heat, Pipe Debonder breaks the cement bond holding the PVC pipe and fitting together without damaging the integrity of the original fitting. This process eliminates the necessity of removing and replacing the fitting, thus saving time and money. Using a process of tightly controlled heat, Pipe Debonder breaks the original cement bond of the broken pipe and fitting by softening the broken pipe. Pipe Debonder's electronic controller asks you to select the schedule and size of the pipe, automatically setting the heating cycle to match the job requirements. The pipe is heated to the exact temperature needed to remove it from the fitting, leaving the fitting cool and undamaged.